Exploring the Wolf Animal Totem came from a gradual pull from my old friend, Spirit Wolf, who showed up in several visions during recent acupuncture* sessions. Wolf energy stayed with me so strongly in such a patient, protective and loving way, that it became a bit of an obsession. Channeling this energy into painting seemed like the only way I could make sense of understanding how and why this powerful energy was manifesting in my life right now. I strongly feel that art embodies the vibration of the artist. The energy of what I paint is embodied into the subject and it often jumps out at me in amazing ways and affects those who can relate to the art piece on a personal level. Artists paint from a broader perspective when they are connected to their higher muse–art is a bridge from this higher perspective to the canvas. 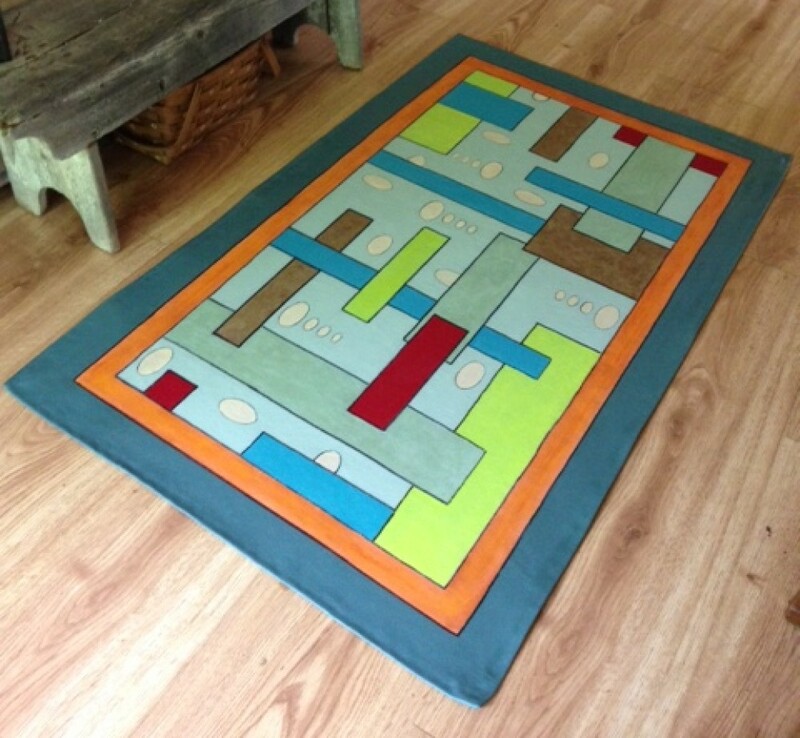 When I paint intuitively, I feel the tapping of that higher place and allow it to flow as I paint. If you can’t paint what you feel deeply inside, walk away from the canvas until you can. Wait for the flow and it will pop out into your expression on canvas. I always find this process amazing. It was in this way that I started my wolf paintings journey. Aspects of wolf spirit that resonate strongly within me are: Strong connection with instincts or intuition; High intelligence, wisdom; Loyalty and communication; Deep desire for freedom. It is these aspects I feel in my life that are pushing me to strengthen my intuitive side and utilize my empathic nature to follow a new path. The old ways of being no longer work for me. The attributes of wolf spirit are helping to show the way by showing up in specific moments of my life with their messages. Wolf is the pathfinder. My wolf showed up waiting patiently, watching from the sidelines in a protective sense, reminding me that he is there when I need him. He also showed up “in my face” asking me to focus! Straying off my path is a habit of mine….staying focused, aware, and open to wisdom in an intuitive way will show me the new path that is calling me. 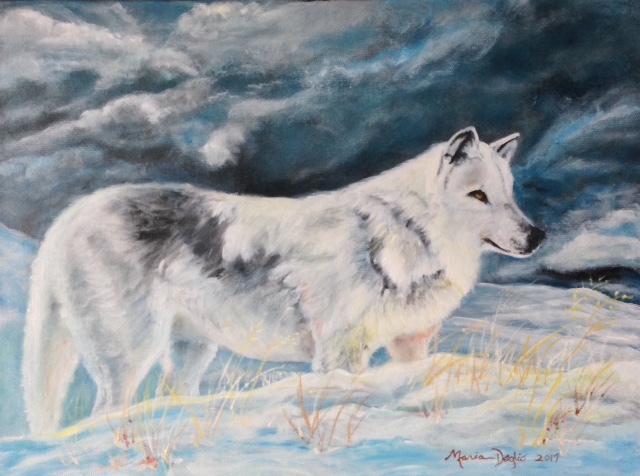 My inspiration for my wolf paintings came from photos from the internet, (photographers unknown, but am grateful for the inspiration they gave me). 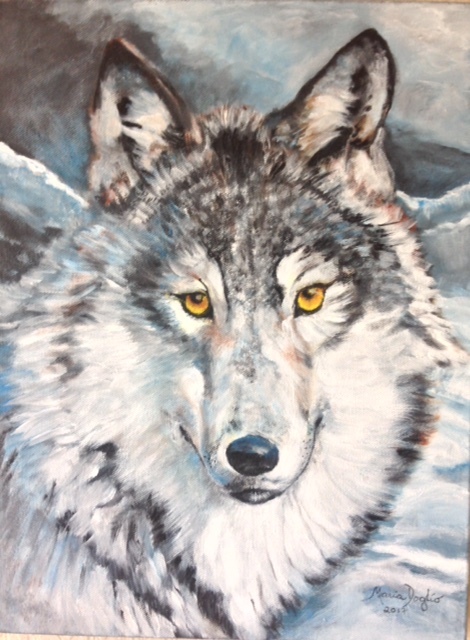 I wanted my first painting to reflect the wolf I was reunited with during a shamanic healing journey vision in the early 1990’s. To this day, I can close my eyes, feel it’s fur and his energy as well as the deep emotion of that reunion. It was a very powerful journey. Spirit Wolf, for me, embodies the wolf of that journey. This painting journey had many lessons on many levels. Each subject was a huge challenge and wonderful lesson in painting fur! Capturing the spirit of the wolf that I was feeling was dependent on that flow from the higher perspective. You can feel it when it clicks in, and keeps you going until you allow the painting to tell you when it’s finished. May you be inspired in your creative journey; challenge yourself – you’ll be amazed what you can do! *Special thanks to David Wolff Filipello, L.Ac, whose kindred spirit, shared wisdom and healing sessions have helped reunite me once again with the wolf spirit energy expressed here. The journey never ends.